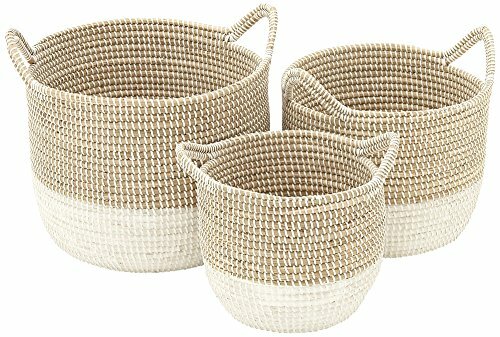 The open-top, woven baskets in this three-piece, assorted-size set are made of natural textured seagrass. Round in shape and sized for a variety of functional and decorative uses, they feature a tight weave in natural hues and white tones, with woven handles. - Round, natural seagrass woven baskets. - 3-piece set with large, medium and small size. - Natural tan hue and white finish. - Textured seagrass and metal construction. - Large is 18" wide, 15" deep, 16" high. - Medium is 16" wide. - Small is 13" wide. Round, natural seagrass woven baskets. 3-piece set with large, medium and small size. Natural tan hue and white finish. Textured seagrass and metal construction.